Methamphetamine is a powerful, highly addictive stimulant used illicitly around the world. Common slang terms for methamphetamine include: speed, meth, crystal, crystal meth, glass, shards, ice, and tic. 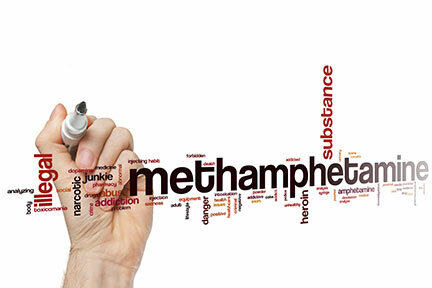 Methamphetamine is a potent central nervous system (CNS) stimulant that is mainly used as a recreational drug and less commonly as a second-line treatment for attention deficit hyperactivity disorder and obesity. Illegal meth for recreational use is obtained either through smuggling into the country, or by being manufactured locally in clandestine laboratories (meth labs). These meth labs may be found in houses, commercial buildings, cabins, mobile homes, RVs, and even vehicles. Meth is easy to make and the ingredients are cheap and common, increasing the likelihood of contamination of properties locally, nationally, and globally. Exposure to even small amounts of the poisons found in meth can damage humans’ nervous systems, liver and blood production mechanisms, as well as respiratory illnesses. Small children suffer most. Exposure can trigger birth defects and developmental problems in babies in the womb. If you accidentally buy a house which is contaminated with meth, your health isn’t the only thing at stake. You could get stuck with tens of thousands of dollars in costs for testing and hazardous-materials cleanup. Disclosures matter because, in most jurisdictions, if property that you own turns out to be contaminated, you must pay the cost of testing and cleaning it up, whether or not you were aware of the home’s history. Increasingly, communities and states are setting strict standards for cleanup. It has become enough of an issue that officials in Utah have taken action. In 2009, it became illegal in Utah for a property owner not to tell a buyer if the home was used to "use, store or manufacture methamphetamines." Following suit, meth was also added to the Utah Association of Realtors disclosure form. Other potential health hazards are lumped together, like asbestos and mold, but not meth. The association deemed meth serious enough that it gets its own line. In 2009, it became illegal in Utah for a property owner not to tell a buyer if the home was used to "use, store or manufacture methamphetamines." Sellers are legally required to be honest on disclosure forms but obviously that doesn't mean they always are. Also, the way the form is worded leaves room for doubt because a seller might not always know what some previous owner or tenant might have done in the home. The current standard for decontamination in Utah is 1.0 µg/100cm² (read as one microgram of methamphetamine per 100 square centimeters of surface area). Properties can become contaminated from any kind of methamphetamine activity including the production, use, cutting, selling, or distribution. Persons who are personally contaminated (such as on their clothing or in their hair) can carry contamination into a property when they visit or enter the property. The level of contamination depends on the amount of activity conducted on the property. A single event can result in detectable levels of contamination. 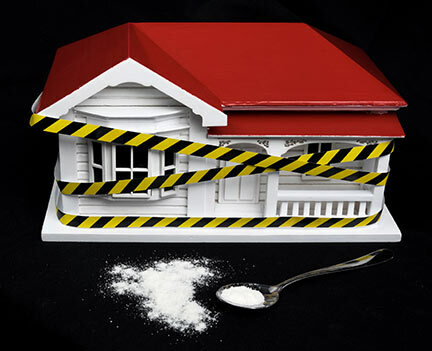 A dwelling can become contaminated with methamphetamine residues if the drug is manufactured or smoked within it. Smoking usually results in much lower residue levels compared with manufacturing. However, the presence of even trace levels of methamphetamine residue can pose a health risk. Homes can be left toxic if someone has simply smoked methamphetamine a few times. The drug can leave behind toxins that cause respiratory and other illnesses. Meth can be detected in homes after a small number of uses, and the residues persist in homes for many years, meaning that if anyone ever smoked meth there in the past, it may show up in a test. So, while the current occupants may not be using meth, the house will still be contaminated, unless proper decontamination procedures have been performed to remediate. 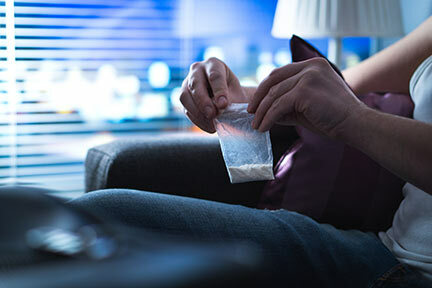 Often, owners don’t know if meth, which can linger on surfaces, in carpets, drywall and duct work for years, has been used in the home at any time. The only way to be certain is to test. HOW DO YOU TEST FOR METH? If you are considering a home purchase, there are professionals who know exactly where and how to test. In order to obtain the most accurate results, it’s best to HIRE A PROFESSIONAL and be sure that a certified laboratory tests the samples. A visual inspection of the property is NOT a good way to determine whether there is meth contamination. While properties which have been used as meth labs often have tell-tale signs, most properties that test positive for the presence of meth do not show visible signs of meth use. A common misconception that one can simply smell the presence of meth is also misleading. A coat of paint, carpet and surface cleaning can make a house look and smell presentable, but these methods do not remove the dangers of the toxicity of meth residue which will stick to any surfaces it comes in contact with until the property has been professionally decontaminated. The ONLY way to be certain there is not a health concern due to the presence of meth in a property is to have it professionally tested. Our inspector collects a methamphetamine residue sample which is swiped from bathrooms, the ventilation system, and any other suspicious areas where someone may use meth. The sample is then submitted to a certified laboratory qualified to run the test. 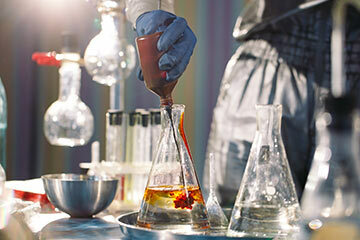 We use ALS Laboratory Group, a globally accredited laboratory, specializing in environmental testing. The lab then sends the test results in 5 business days, or as soon as the next day for a nominal rush fee. If these samples show residue over the limits specified (1.0 ug/100cm2 in Utah), the property is considered contaminated. WHAT IF THE RESULTS COME BACK POSITIVE? While many believe a positive result is an automatic deal breaker, this does not have to be the case. Certified Decontamination Specialists are available to remediate the contamination, restoring the property to like-new conditions. In most cases, the buyers’ realtor can negotiate with the sellers to cover the cost of the decontamination. Utah is a regulated state for methamphetamine contamination and methamphetamine decontamination. In addition, The Salt Lake County Health Department uses the strictest interpretation of the Utah State Methamphetamine Decontamination Code. This means that if you home or business is in the Salt Lake County area the standard that must be met during Methamphetamine Decontamination process is very strict and needs to be decontaminated by a professional. Methamphetamine Decontaminating a home or business usually takes about 3 weeks from the time a permit is secured from the county health department. In order to make an informed decision, use the Utah Department of Health’s guide to Hiring a Certified Decontamination Specialist. For more information regarding decontamination, you can also contact the Certified Decontamination Specialists at AEI Decon (Apple Environmental). Because methamphetamine production and use results in aerosolization of hazardous compounds which then may contaminate every surface in a property, clean-up can require extensive decontamination and testing. The Environmental Epidemiology Program recommends using a certified decontamination specialist when decontaminating a property. Once a property has been confirmed by law enforcement as a meth lab, the property will be placed on the local health department's "Contaminated Properties List"
Certified Decontamination Specialists, or the owner of record, must do a Preliminary Assessment of the property. A work plan detailing what and how the decontamination work will be done is submitted and reviewed by the local health department by the owner of record, or the decontamination specialist. After the work plan is followed and completed, confirmation sampling by a Certified Decontamination Specialist must have results that fall below the State's decontamination standard. After the confirmation sampling has been completed, a final report must be completed and turned into the local health department. Once the local health department has reviewed and approved the final report, the property will be removed from the local health department's "Contaminated Properties List". At Morrison Inspection Company, we spend the time and have the proper expertise and equipment to test and decontaminate meth properly. We follow the Utah Department of Health's guide to Hiring a Certified Decontamination Specialist and use the ALS Laboratory Group to test the samples.